There's something about Molde FK. The minute the legendary Ole Gunnar Solskjaer was returned to his throne at the club, Celtic entered - what they thought was a relatively welcoming European double-header against the deposed and supposedly struggling Norwegian champions - with trepidation. Molde had been left peering through the dust as Rosenborg roared into the distance to reclaim the Tippeligaen for the first time in five years. The attitude in Trondheim is that Molde had finally been put in their place after some recent glory years with chants of "we hate Molde" reportedly heard from a Rosenborg reception to celebrate their triumph. This has not sat well with the upstarts of Romsdal county, who have dominated the Norwegian top flight since Solskjaer's first spell in charge of a club where his legendary status is secure. However, the 42-year-old's retaking of the reins - albeit caretaker Erling Moe continues to pick the team - has dovetailed with their extraordinary opening to Europa League Group A. And, as Celtic found out less than a fortnight ago, Molde have left their best form until the end of the campaign as they prepare for the quick-fire return in Glasgow on Thursday. Despite their more than disenchanting attempt at winning a fourth title in five years, Solskjaer's side has every chance of a successful late-season salvage mission. They have only one league match remaining, this weekend at Start, with a win required to stand a chance of qualifying for European football next term. Even then, sixth-placed Molde need favours from others. Firstly, slip-ups by one of Celtic manager Ronny Deila's old teams - Odd Grenlund and Viking Stavanger - are needed if they are to finish in fourth place. If that long-shot can be attained, they will have to grit their teeth and roar on the new champions, Rosenborg, in the Norwegian Cup final against Sarpsborg later in the month. In the eyes of many, on paper at least, these two Europa League fixtures would be the ones that would propel Celtic into the last 32. Now it is Molde who stand on the brink of history and a European knock-out berth for the first time in their history. Star defender Vegard Forren - who volleyed the second in the 3-1 win on match-day three - has targeted another points plundering at Parkhead in the wake of an unbeaten start to the group. "We travel here with good confidence in the team," Forren told BBC Scotland. "Celtic at home will always be favourites, so it's going to be a tough game, but hopefully we can come here and make it difficult for them. "I think the pressure is on them, so hopefully we can use that to our advantage. "We have confidence that we can come here and get three points." 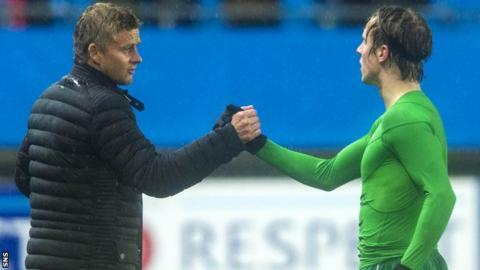 To many in Norway, the fact that Forren still plies his trade in his homeland is a mystery, something that was exemplified by a classy performance against the Scottish champions. The 27-year-old has bounced back from a short-lived spell at Southampton and is likely to play an integral part in Norway's Euro 2016 play-off games against Hungary. Should they pull off an unlikely double over Deila's men, any points spilled by Ajax against Fenerbache in Amsterdam would propel the bottom seeds through with two games to spare. Forren is expecting a different animal to the one that surrendered in the howling wind and rain in north-west Norway with Kris Commons' spat with Celtic assistant John Collins dominating the post-match headlines. "I think we maybe surprised them a little at home and they, of course, will want to revenge the loss," the centre-back added. "It's a completely different game, it's going to be tough." Asked if Molde would be happy with a draw, Forren added: "Yeah, of course, but we're optimistic and hope for three points. "But one point for us is good because Celtic need three." How Deila will hope to avoid that agony as his countrymen aim to provide what some would see as a fatal blow to his long-term Celtic career.